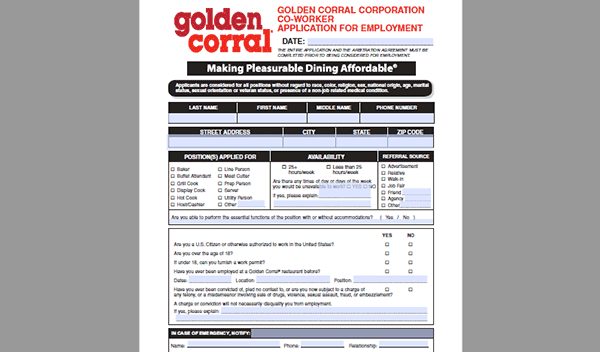 Download the Golden Corral job application (in .PDF format) using the link on this page. 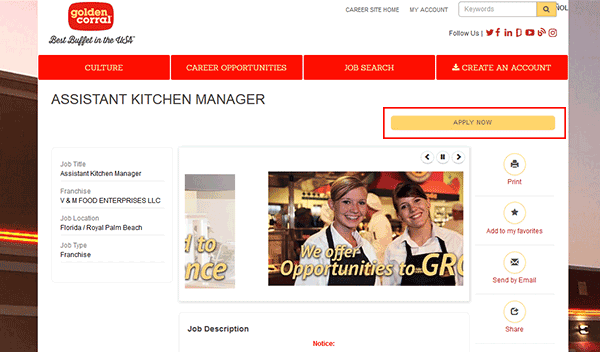 The application can also be filled out online by visiting the company’s recruitment website. Hourly, operations/management, and corporate positions can all be applied for on the recruitment site. 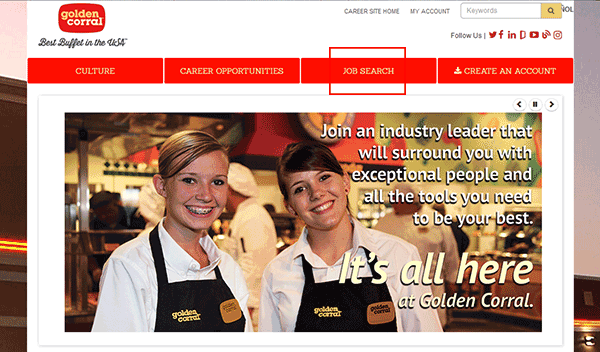 About the Company: Golden Corral is a chain of buffet restaurants based out of Raleigh, North Carolina. The company has more than 500 locations throughout the majority of the United States. 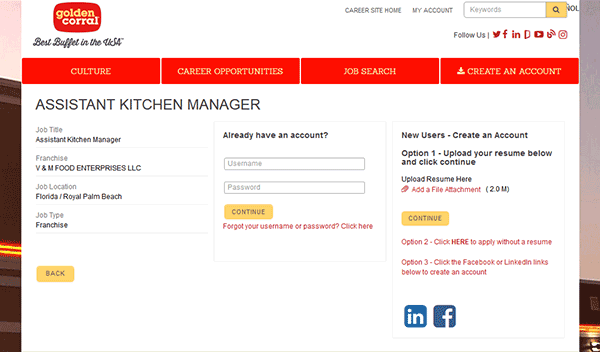 Step 2 – Click the “Job Search” link. 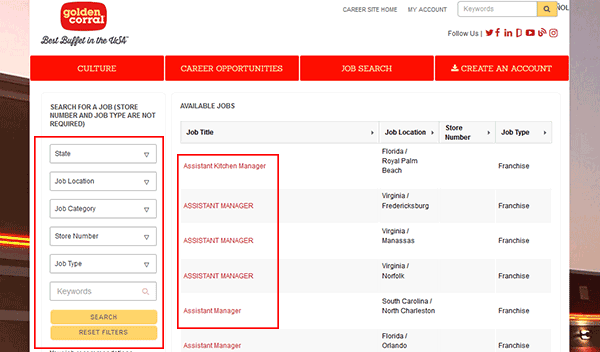 Step 3 – Search current openings by selecting a state, location, category, store number, or job type. Click the link of the position you want to apply for. 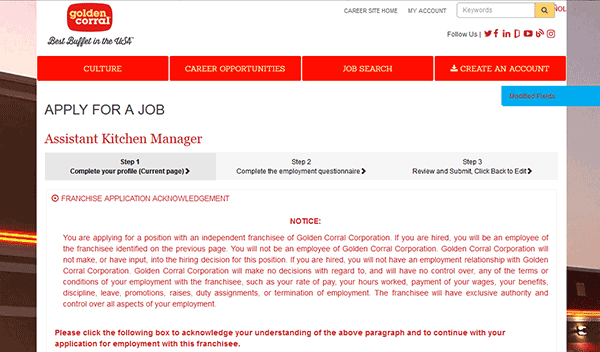 Step 4 – Read the job description and then press the “Apply Now” button. Step 5 – If you already have an account sign in to it. If you need to create a new account click one of the links on the right-side of the page (outlined in the screenshot). Step 7 – Complete the employment questionnaire and then submit the application. Step 1 – Download the .PDF file from the link at the top of the page. Step 4 – Sign your name and then date the form (dd/mm/yyyy format).